Wine with fun names and quirky labels can go in many directions, the eye catching label art doesn’t always translate to a mouth pleasing experience. In this case it does, this is a fun, yet seriously good zinfandel, perfect for Halloween toasting. The wine is made by Armida Winery by winemaker Brandon Lapides. Brandon has a history of working with other wineries that specialize in zinfandel. He knows zin, when to pick it, where to source it and how to make it. Zinfandel is a wonderful grape that when handled correctly makes for a lush, jammy, spicy and food friendly wine. The zinfandel grapes themselves are larger in size and that can translate to higher alcohol content in the warmer growing regions of California. 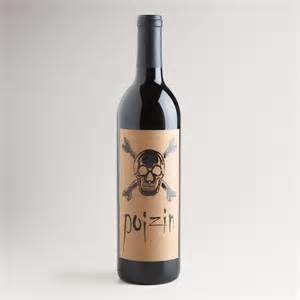 Poizin Zinfandel, with it’s quirky name is a balanced and flavorful wine. It will pair nicely with pizza, pasta, burgers, veggies and much more. Cheers!